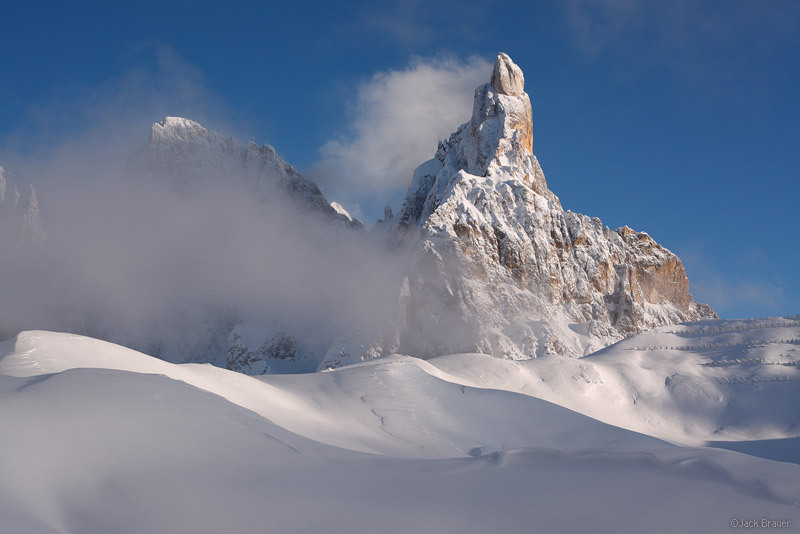 This afternoon I repeated my efforts to photograph Cimon della Pala. I felt like luck was with me today, for various trivial reasons not worth mentioning but nevertheless noteworthy to me. 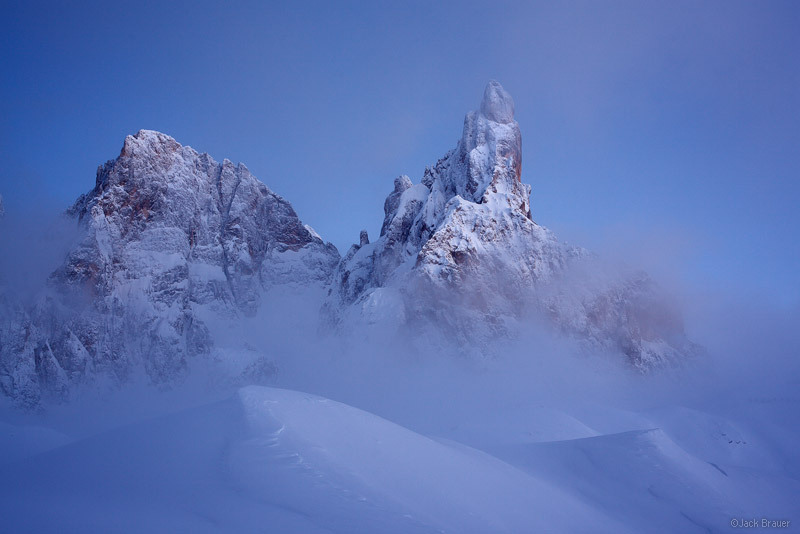 Again I parked at Passo Rolle and skied up the ski slopes in the midst of the clouds. Sure enough, halfway up the slopes I could see some clearings and soon the Cimon della Pala broke out of the clouds in all its glory! I didn’t get the wild orange light and swirling clouds of Monday, but what the hell, I’m stoked. Is this an epic scene or what??!! It looks like some peaceful snowy meadows just got shafted by a pissed off chunk of earth! The low clouds rolled in at sunset, but I waited for while anyways. They broke again later at dusk, revealing the Pala in the mist. It would be cool if I could show a series of all the photos I took this evening. These are only a few that I picked from the batch. Throughout this week I’ve noticed how the clouds open and close around these peaks, and I know that this area would be a paradise for time-lapse photographers! I’m finally feeling satisfied with my time in San Martino, and to be honest I am also at this point satisfied with dedicating so much effort to photography… time for some snowboarding! Tomorrow morning I’m headed to Arabba for the opening day of the ski hill there… hopefully there should be plenty of powder waiting for me! 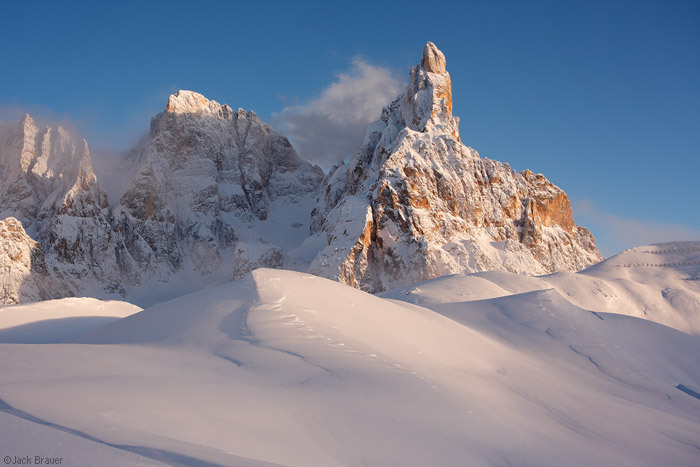 Posted in Alps & Europe and tagged Dolomites, Italy on December 3, 2010 May 19, 2013 by Jack Brauer. 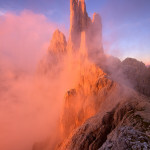 ← Previous: "Thursday in San Martino"
Happy to hear you bounced back on top, some super images. The last one especially, I would crop the top and bottom just a bit to have a little less dead space and then it’s a very moody beautiful dramatic mountainscape! Awesome Jack! Enjoy the riding tomorrow. We’ve had a pretty good start at home as well. Looks like another hammerin’ coming just in time… after the weekend.